There is no writer who has more of an affect on my life than Brian Jacques. No, the Redwall books are not masterpieces, but I can say they are wonderful, endearing, beautiful books. The world he created and the people he touched with it is incredible. I read the books in middle school and they have stayed with me ever since. In my early days on the Internet, I found fellow Redwall readers. I found the stories, art, and friendship they shared through their love of the Redwall series. In the long run, the Redwall series has made me the artist and the person I am today. There is no other way to cut it. 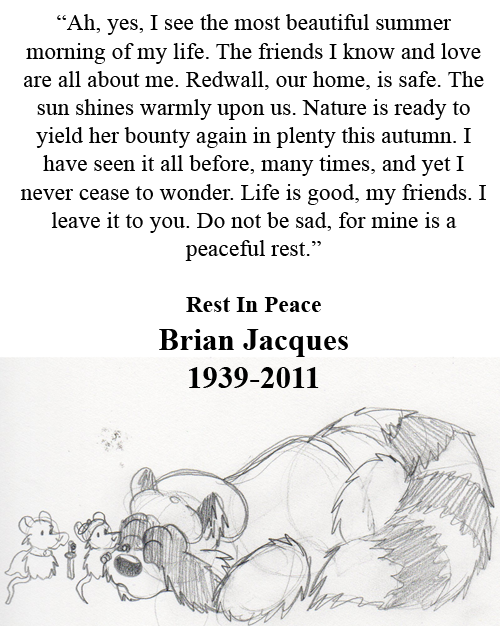 I cannot imagine I would be where I am now without Redwall and Brian Jaques in my life. I have grown up and moved forward, and even though I haven't read a Redwall book in years, those books are, and will remain, an undeniable part of me. Without Brian Jacques, this quirky little comic would not be around. I don't believe that either Geo or Ronts or any of these characters would be around. 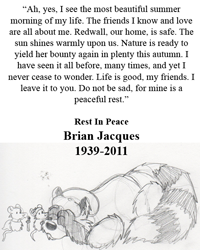 Thank you, Brian Jacques. I really wish I could have met you to put my foot in my mouth trying to say how much you meant in my life as a whole. I will cherish your memory, and stories you told, forever.